Missouri maps from Omnimap, the leading international map store with 275,000 map titles. Beautiful plastic 3-D maps of Missouri. Missouri Topographic Atlas & Gazetteer. DeLorme. Excellent atlas using USGS topographic maps. Ideal for hikers or backroad enthusiasts. Route 66 Road Atlas. ITMB. The 'Mother Road' of the USA is one of the most famous highways of the world, ranking in importance with adventure highways such as the Karakorum. When the highway was developed in the 1920s, America was just discovering the automobile and long-distance roads were visionary. This road assumed monumental significance in joining the western half of America to the more developed East. Initially a dirt track, it was paved as a massive 'make work' project during the Great Depression, and millions of destitute Americans moved along it to reach California and, hopefully, future prosperity. During WW2 and the Korean War, it was the route of preference to move large numbers of troops to training camps and embarkation points. Today, it has been replaced by super-motorways, the US Interstate system, but large portions of original highway remain, as well as many buildings from the early days of travel. Immortalized and romanticized by several movies, a TV show, and various songs, Route 66 symbolizes everything that means AMERICA. This atlas shows the route from its origins in Chicago, through Illinois and other states to California and its terminus in Santa Monica. Not only is the route followed and filled in with capsule comments about attractions en route, it includes all parks, historic sites, and attractions within reasonable driving distances from Route 66. This is the only highway in the world to have its own atlas. It is beautifully arranged and very detailed. It covers the entire 2,400 miles of the Route and includes many detailed city plans of urban areas along the highway. As a bonus, the Las Vegas and San Diego urban areas are included; 64 pages, printed on paper, saddle stitched. Center-stapled soft-cover atlas. Missouri Road Map - Paper. Rand McNally. Rand McNally's Easy To Read State Folded Map is a must-have for anyone traveling in and around Missouri, offering unbeatable accuracy and reliability at a great price. Our trusted cartography shows all Interstate, U.S., state, and county highways, along with clearly indicated parks, points of interest, airports, county boundaries, and streets. Includes inset city maps of Branson, Cape Girardeau, Columbia, Jefferson City, Joplin, Kansas City & Vicinity, Downtown Kansas City, Poplar Bluff, St. Joseph, St. Louis & Vicinity, Downtown St. Louis, and Springfield. Map size is 28 x 40 inches unfolded. $5.99 62-7790 1 sheet, folded. Missouri Road Map - Paper. Universal Map. The Missouri fold map is a full-color, regional map, including: Branson, Cape Girardeau, Columbia, Downtown St. Louis, Jefferson City, Joplin, Kansas City vicinity, Springfield, St. Joseph, and St. Louis vicinity; and features: Airports, Interstate Exit Numbers, Longitude and Latitude information, Missouri Facts, Parks and Rec Areas, and Places of Interest. $6.99 62-77902 1 sheet, folded. 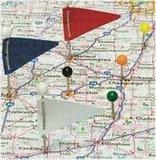 Missouri Easy-to-Fold™ Road Map - Laminated. Rand McNally. The durable and convenient Missouri EasyToFold state map will take all the wear and tear your journey can dish out. The heavy-duty laminated design allows you to mark your route, make notes, then wipe the surface clean for further use. Size is 18 x 17 inches unfolded. $7.95 62-77901 1 sheet, folded. Missouri Road Map - Laminated. Universal. This map of Missouri State is durably laminated and contains extensive coverage. Laminated maps are easy to fold, write on, and wipe off. Coverage includes enlarged insests of: Branson, Cape Girardeau, Columbia, Kansas City, Jefferson City, Joplin, St. Joseph, St Louis, and Springfield; and features: Campgrounds, Downtown St. Louis, Interstate Exit Numbers, a Mileage Chart, Ohio facts, Parks and Rec Areas, and Places of Interest. $9.99 62-77904 1 sheet, folded. Missouri City Maps - Paper Maps. Various publishers. $5.99 62-7792B Branson City Map. (Universal). $7.99 62-7792KAN Kansas City city map. (Universal). $6.99 62-7792KB Kansas City city map. (Rand McNally). $4.95 62-7792EKC East Kansas City city map. (Rand McNally). 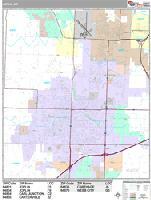 $5.99 62-7792KAC Kansas City & Vicinity Street Map. (Seeger). $5.95 62-7792LA Lake of the Ozarks Street Map. (Seeger). $7.99 62-7792SPR Springfield/Joplin city map (same as Joplin map above). (Universal). $4.95 62-7792SC St. Charles & St. Peters Street Map. (Seeger). $6.99 62-7792S St. Louis City Map. (Rand McNally). We offer wall maps for Blue Springs, Columbia, Florissant, Independence, Jefferson City, Joplin, Kansas City, Lee's Summit, O'Fallon, Springfield, St. Charles, St. Joseph, St. Louis, and St. Peters. Sample detail from the Joplin wall map. Missouri has three long-distance trails that traverse the state. These include the Great Rivers Trail; the Lewis & Clark Trail; and the TransAmerica Trail. Click here for our Missouri cycling maps & guides list. Click here for our Missouri fishing maps. 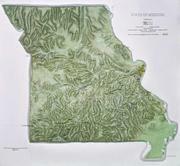 We stock all USGS topographic maps of Missouri at all available scales. Hubbard makes an excellent 3D vinyl raised relief map of Missouri. Click here for a raised relief map of Missouri. Ozark Scenic National Riverway Map. 1:63,360. Trails Illustrated/National Geographic Maps #260. A comprehensive, two-sided topographic map of the Ozark National Scenic Riverways. Includes comprehensive river and trail mileages, campsite and recreational points-of-interest, and trail descriptions for the Ozark Trail, Pioneer Forest Lands, Montauk State Park, and State Conversation Areas. Insets provide information on local hunting, fishing, ATV, equistrian, and spelunking regulations. Printed on 100% plastic material which is waterproof and tear-resistant, ideal for backpacking or river trips. Map includes UTM, Lat/Lon grids, and declination information for use with GPS or compass. $11.95 63-2100-260 1 sheet, folded. Missouri State and County Wall Maps. Intelligent Direct. 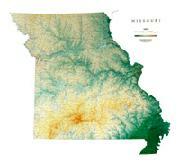 Missouri Shaded Relief Wall Map. 1:550,000. Size is 42 x 46". From the Boot Heel in the southeast to the Missouri River where it enters the state, Missouri is a land of plains, rich farmland, low mountains, caves, plateaus, and springs, rivers, and lakes. Elevations are represented by color, and this, in combination with our relief shading technique, gives the map a 3-dimensional look. $40.00 62-7751 Missouri. 42 x 46". Missouri Topographic Map. 1:500,000. 1973-1978. USGS. Size 50 x 56 inches. Missouri Satellite Posters. Spaceshots and Satprint. Sample of the Missouri satellite poster. Sample detail of the St. Louis satellite poster. $34.95 67-87925 Missouri satellite poster. $34.95 67-879651 St. Louis satellite poster. Normal color. 24 x 36". Missouri Magnetic Anomaly Map. 1:500,000. 1985. USGS (GP-965). One sheet in black and white. Map size is 120 x 106 cm. Missouri ERTS Band 7 Photomosaic Map. 1:1,000,000. 1974. MGS. This black/white map highlights topography and water features. Map size is 64 x 56 cm. $3.95 62-1000MO Missouri flag, small. Size 4 x 6 in. $9.95 62-1001MO Missouri flag, medium. Size 8 x 12 in. $39.95 62-1003MO Missouri flag, large. Size 2 x 3 ft.